Keep all of the flavor you crave without the guilt. We tend to have a formula for how we celebrate summer holidays: pool parties, beach days and outdoor barbecues. Is it really even a party without grilling up some tasty food and popping open a few cold brews? But a day spent in the backyard can take a toll on our waistlines. A British study conducted by Weight Watchers found that the average Brit consumes 3,200 calories at each barbecue (that’s equivalent to eating six Big Macs!). Researchers hypothesize that this is due to the lack of structure in the typical barbecue mealtime. Instead of sitting down to a meal as you normally would, you’re more prone to graze for hours at a time, loading up multiple plates — and enjoying a burger and a hot dog (how can you choose just one?). A recent study found that the average person consumes 3,200 calories at each barbecue — that’s equivalent to eating six Big Macs! Forty-two percent of those surveyed admitted to eating an average of six meat items at each barbecue. Which isn’t just alarming in terms of calories — we’re also consuming dangerously high amounts of fat in the form of burgers, hot dogs, sausages and processed meats. Not to mention, the mayo-laden sides, sugary condiments (we see you, barbecue sauce and ketchup), and that summer shandy (or three). The easiest way to keeping calories, fat and sugar — and your summer body — in check is portion control. But, we all have to admit, once we’re faced with a barbecue spread (two margaritas deep) it’s too easy to go hog wild. 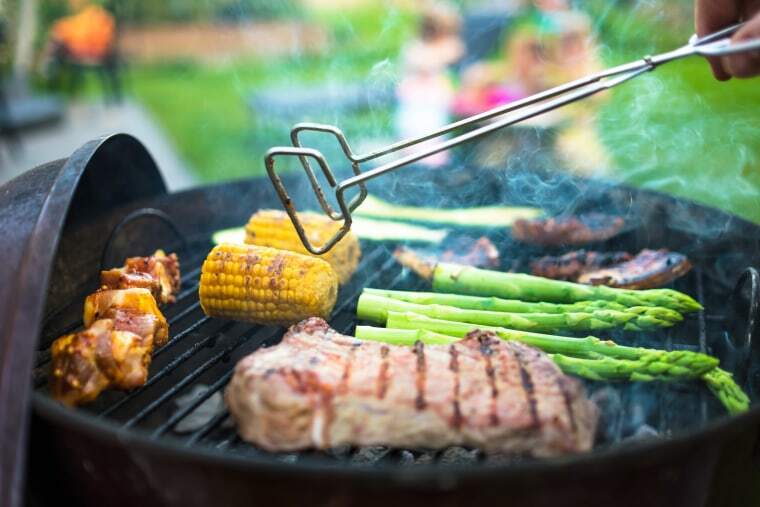 Even though a third of the 2,000 adults questioned admitted they eat more food than usual at barbecues, almost half of them chose to forget how many calories they were consuming and ate as much as they wanted. The whole portion-control thing may be easier said than done, but you can help cut back on the guilt of loading up plate after plate by rehabbing some of the worst offenders on the menu. By packing the spread with better-for-you options that cut back on the sky-high sugar and fat levels found in standard barbecue favorites, you can soothe your guilty conscience — and keep the meal from spiraling out of control. Don’t think it’s possible to remake your favorites in a healthier way? Think again. Here are 12 nutritious recipes that keep all of the flavor you crave without sending you into fall with a head start on that winter weight gain. The burger is the mainstay of the barbecue spread. Fire up the grill and toss on one of these healthier options. They are lower in saturated fat, but rank high in creativity and flavor that will have all of your guests coming back for seconds. No barbecue is complete without the quintessential sides. We're talking coleslaw, macaroni salad and slices of juicy watermelon.